Watch and control Sky TV from any TV in the home. A simple and cost effective way to distribute digital TV pictures from your Sky box to a TV situated in a different room in the home. This TV Link system is easy to install. 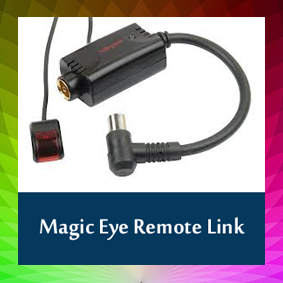 It sends the remote control signals received from the magic eye to the Sky digital receiver in the living room via the a coaxial cable/standard Aerial Cable. Would you like help installing your new Magic eye TV link? Well if you purchase from us you will be directed to a Youtube video of "how to install a Sky magic eye" as well as detailed instructions with diagrams & pictures to keep the whole setup as simple as possible. Q: Is there a delivery charge and how long does it take? A: Standard delivery throughout mainland UK is free of charge when the order value is over £10.00. Delivery Time: You can usually expect delivery within 3 working days of the items being despatched. It's easy to be wise after the event and for this reason we offer a 7 day return policy. If for any reason you find that your recent purchase is not quite what you wanted. Then if returned within 7 days of purchase, we will replace, offer a credit note or refund your unsuitable purchase to equal value. This is provided the goods remain in their original condition, unopened and unused and accompany all packaging an accessories they came with, returned to us within 7 days.